Deputy Prime Minister Vuong Dinh Hue has urged Indian businesses to invest more in Vietnam, which has joined 10 free trade agreements of key regions in the world. Talking to a delegation of the Confederation of Indian Industry led by its President Naushad Forbes in Hanoi on November 2, the Deputy PM said the business and investment environment in Vietnam has improved greatly thanks to the revised laws on enterprises and investment. 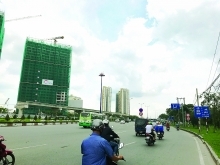 The Vietnamese government is creating favourable conditions for both domestic and foreign investors with the aim of having one million domestic enterprises by 2020. 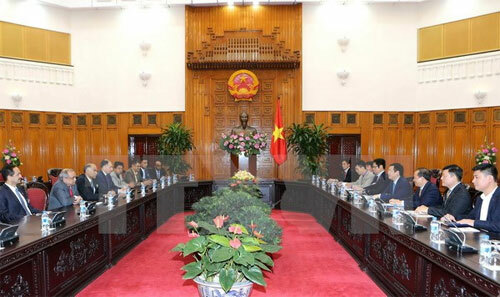 He suggested Indian firms invest in projects under Vietnam’s electricity master plan No.7, particularly the Long Khanh thermal power plant, or in textile-garment and leather-footwear, which have great potential once the Trans-Pacific Partnership (TPP) takes effect. Deputy PM Hue also informed the Indian delegation that Vietnam encourages investment in the form of BOT and PPP, along with the transfer of technology and energy-saving machinery in the automobile industry and construction. Naushad Forbes said businesses of both countries are seeking opportunities for cooperation in the fields of renewable energy, information technology, climate change adaptation, among others, as seen at the business forum held earlier during the day. Indian business representatives expressed their trust in the political and economic ties between the two countries. At the same time, they were of the opinion that bilateral trade, at 5 billion USD at present, does not match both sides’ potential. They pledged to do more to promote long-term investment and trade ties in the time ahead. Indian businesses noted their wish that the Vietnamese Government help remove difficulties that are hindering some cooperation projects in hydro power, automobile assembling, pumping stations to prevent floods in urban areas, pharmaceuticals and transport infrastructure./.